The earliest evidence of a Pisan “Studium” dates to 1338, when the renowned jurist Ranieri Arsendi transferred to Pisa from Bologna. He along with Bartolo Da Sassoferrato, a lecturer in Civil Law, were paid by the Municipality to teach public lessons. 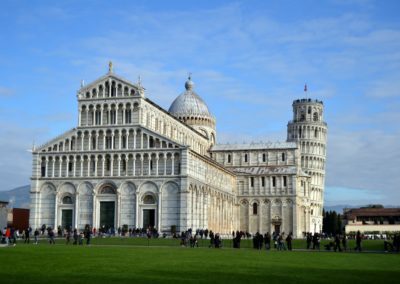 The papal bull ‘In supremae dignitatis‘, granted by Pope Clement VI on 3 September 1343, recognized the ‘Studium’ of Pisa as a ‘Studium Generale‘; an institution of further education founded or confirmed by a universal authority, the Papacy or Empire. 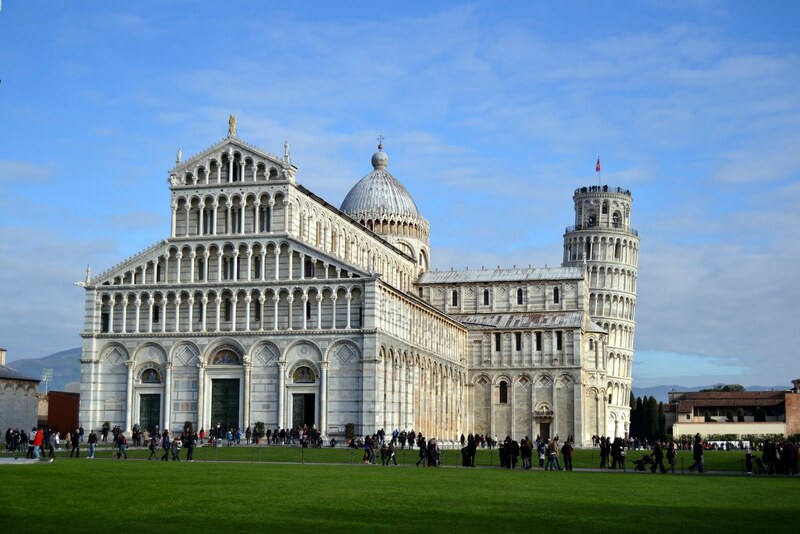 Pisa was one of the first European universities that could boast this papal attestation, which guaranteed the universal, legal value of its educational qualifications. The first taught subjects were: Theology, Civil Law, Canon Law and Medicine. In 1355 Francesco Da Buti, the well-known commentator of Dante’s Divine Comedy, began teaching at the “Studium”. 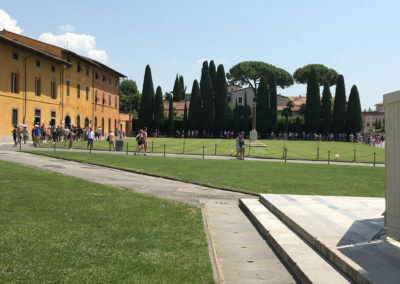 Pisa and its “Studium” underwent a period of crisis around the turn of the 15th century: the Florentines’ conquering of the town ruined its economic and social life. Indeed, there is a lack of documentary evidence of the University’s regular functioning for decades. 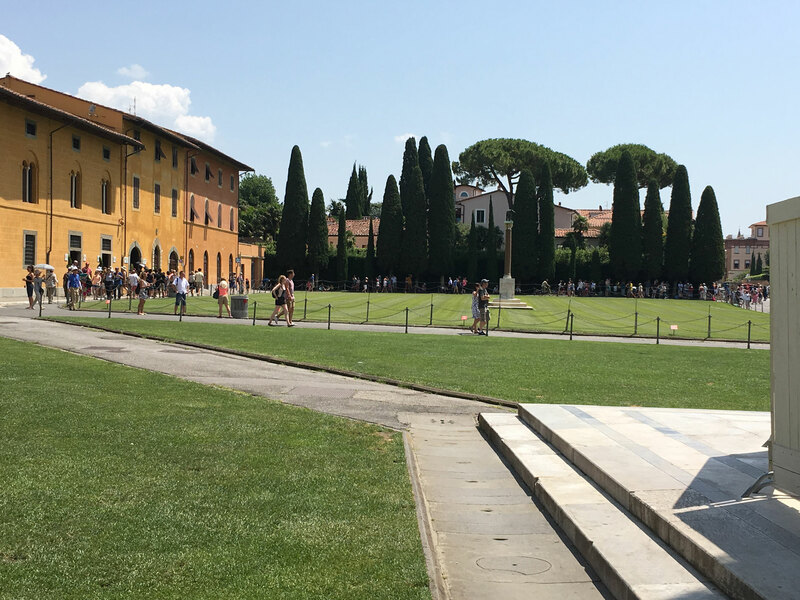 In 1473, thanks to Lorenzo dei Medici, the Pisan Studium resumed its systematic development and the construction of a building for holding lessons was provided for in 1486. The building – later known as Palazzo della Sapienza (The Building of Knowledge) – was located in the fourteenth-century Piazza del Grano. The image of a cherub was placed Above the Gate “Dell’Abbondanza” (the Gate of Abundance), leading to the Piazza, still today the symbol of the University. 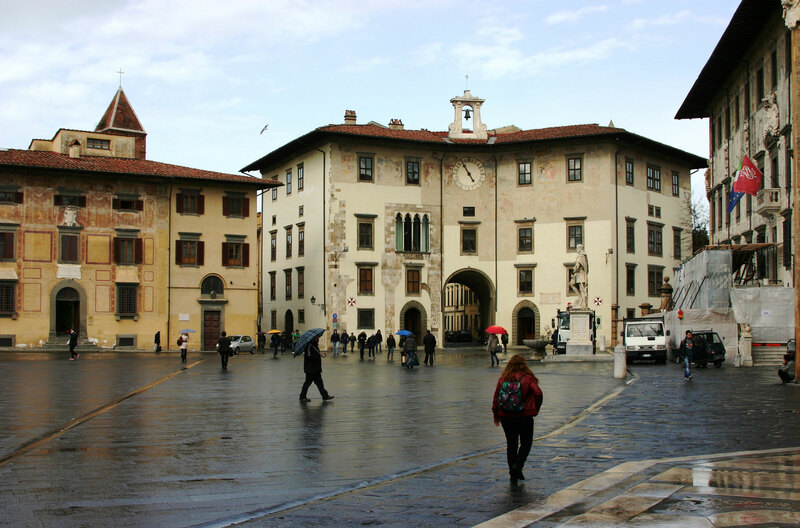 Following the rebellion against Florence in1494 and the war following, the Pisan Studium suffered a period of decline, and was transferred to Pistoia, Prato and Florence. 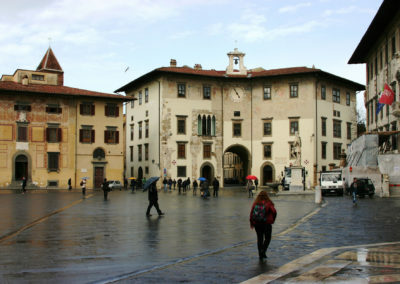 The ceremonial re-opening of the University, on 1 November 1543, under rule by Duke Cosimo I dei Medici, was considered as a second inauguration. The quality of the University was furthered by the statute of 1545 and the Pisan Athenaeum became one of the most significant in Europe for teaching and research. The chair of “Semplici” (Botany) was held by Luca Ghini, founder of the world’s first Botanical Gardens, succeeded by Andrea Cesalpino, who pioneered the first scientific methodology for the classification of plants and is considered a forerunner in the discovery of blood circulation. Gabriele Fallopio and Marcello Malpighi lectured in Anatomy and Medicine. The University’s role as a state institution became ever more accentuated during the Medici Grand Duchy period. A protectionist policy ensured a consistent nucleus of scholars and teachers: laws issued by Cosimo I, Ferdinando I and Ferdinando II obliged those who intended to obtain a degree to attend the Studium of Pisa. This period sees various illustrious figures lecture at Pisa, especially in the field of law and medicine. The University’s development continued under the Lorenas. They completed the construction of the astronomic observatory (a project initiated by the Medicis), as well as enriching the University Library with important publications, developing the Botanical Gardens and Natural Science Museum and they established new chairs, such as Experimental Physics and Chemistry. The annexation of Tuscany to the Napoleonic Empire resulted in the transformation of the Studium into an Imperial Academy: the Athenaeum became a branch of the University of Paris and the courses and study programs were structured following the French public education model. Five new faculties were established (Theology, Law, Medicine, Science and Literature), along with examinations, different qualification titles and graduation theses. In 1813 ‘La Scuola Normale Superiore‘ was established, as a branch of the ‘Ecole Normale de Paris’. The Restoration wasn’t able to cancel the effects of the Napoleonic experience. 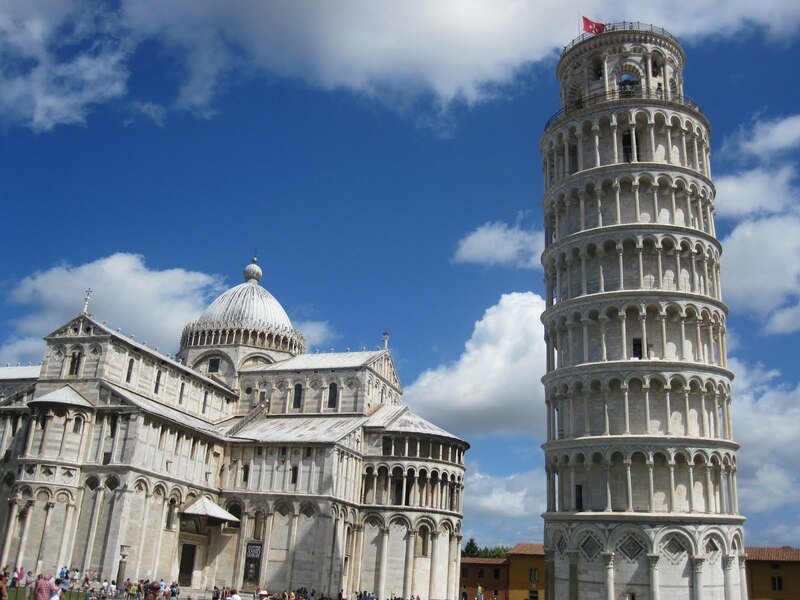 The first Congress of Italian Scientists was held in Pisa in 1839. 421 scientists and over 300 experts of various disciplines discussed zoology, comparative anatomy, chemistry, physics, mathematics, agronomy, technology, botany, vegetation physiology, geology, mineralogy, geography and medicine. In 1839 – 1840 the Director of Education, Gaetano Giorgini, brought about the most important reform in the University of Pisa by raising the number of faculties to six (Theology, Law, Literature, Medicine, Mathematics and Natural Sciences) and created the world’s first chair of Agriculture and sheep farming. In 1846 the Scuola Normale was re-opened. Meanwhile, liberal and patriotic ideals were spreading at Athenaeum and a battalion of the University – composed of lecturers and students – distinguished itself in the Battle of Curtatone and Montanara in 1848. During the ‘Second Restoration’, in 1851, Leopoldo II united the universities of Pisa and of Siena in a unique Etruscan Athenaeum motivated partly by economic reasons, but primarily for political control. The faculties of Theology and Law rested at Siena; while those of Literature, Medicine, Mathematics and Natural Sciences remained at Pisa. Following the Florentine insurrection and the fleeing of the Grand Duke in 1859, one of the initial measures imposed by the Provisory Government was the restitution to the city of Pisa of its Studium with all six of its faculties. 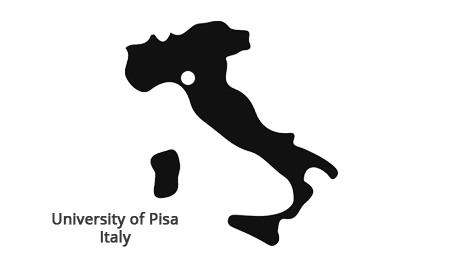 With the birth of the Kingdom of Italy, the University of Pisa became one of the new state’s most prestigious cultural institutions. Between the second half of the nineteenth and first half of the twentieth centuries the following prestigious lecturers taught at Pisa: the lawyers Francesco Carrara and Francesco Buonamici, philologists Domenico Comparetti and Giovanni D’Ancona, historians Pasquale Villari, Gioacchino Volpe and Luigi Russo, philosopher Giovanni Gentile, economist Giuseppe Toniolo and mathematicians Ulisse Dini and Antonio Pacinotti. 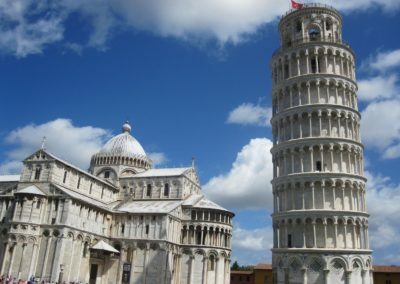 The first European institute of Historical Linguistics was founded in Pisa in 1890. After the second world war the University of Pisa returned to the avant-garde in many fields of knowledge. To the faculties of Engineering and Pharmacy, established pre-war, were added Economics, Foreign Languages and Literature and Politics. In 1967 the ‘Scuola Superiore di Studi Universitari e Perfezionamento S. Anna’ was founded which, together with ‘La Scuola Normale’, formed a highly prestigious learning and teaching centre.